If you are immune to noise, you will most likely find this place to be very nice. The apartment is very clean and well equipped, and the hosts - who live upstairs - are very helpful. The surrounding facilities with access to several sea water pools, lounge chairs and palapas/umbrellas are excellent. It is, however, a very noisy location, and we don't understand how some of the previous reviewers can describe it as a quiet place. The building is next door to the Whala! Hotel, which has loud music every evening till 11 pm, and there is often loud music during the daytime as well. In addition, the boats that take tourists from Bayahibe to Saona Island pass very close to the coast, and most of them have noisy engines and many play loud music. More than 100 boats pass by for about 3 hours in the morning and return during 3 hours of the late afternoon. In addition, we had noise from the balconies of the buildings behind us, where sometimes people were talking on the balconies till past 1 am. To top it off, the owner would occasionally practice playing the guitar on the balcony above us. That was thoughtless, as the owners otherwise tried to reduce the noise for us by letting us move into the other unit downstairs facing away from the hotel, which reduced the noise level a bit. In addition to the noise, the boats create a lot of waves, which makes swimming in the ocean a bit unpleasant for a large part of the day. The waves also make the water unclear, so snorkeling is not very good. There are some corals and fish off the coast, but nothing to write home about. We stayed for 4 weeks. Since we chose this place for the prospects of getting peace and quiet and clear water for snorkeling we were obviously disappointed. However, if you are satisfied with sunbathing, swimming in the pool, enjoying the uncrowded facilities, watching the beautiful sunsets, and you don't care about the noise, then you will like this place. 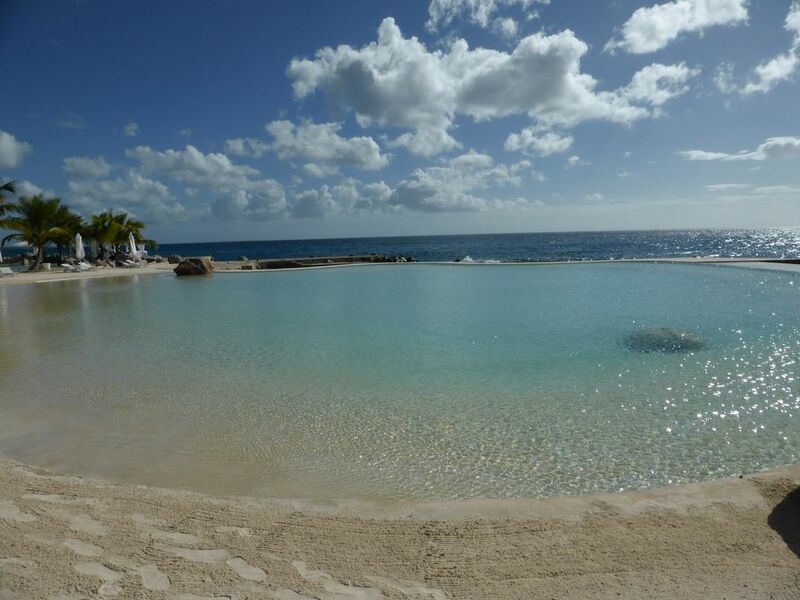 The condo fronts the Caribbean and offers several swimming options: fresh water pools, salt water pools, and the sea. Very good snorkeling right off the pier. Bruno and Milena were delightful hosts and helped make our stay even more special. I highly recommend this villa if you want a beautiful setting, peaceful environment, and access to a lot of recreation options: swimming, scuba diving, horseback riding, and tennis. Or just relax and dine out at several good restaurants within a short walk. It was our pleasure having you at the Villa Marina. We've had a good time together. Like always, the days pass buy to fast. Hope to see you again sometimes. The listing description was accurate; in fact the location was better than expected. The unit was located in a "beach club"; we had access to the club restaurant and amenities which included three infinity pools, a swimming pool and a lovely sanded area, decorated with rocks and plants. Access to the ocean was available by climbing down a few stairs. The unit was clean and the kitchen was sufficiently equipped. Only people staying at the beach club could access the grounds and ocean front so it was not crowded and it was quiet. The staff including the security guard were very friendly and did a good job. You should have some knowledge of Spanish, but you can get by if you try hard. The owner arranged a driver for us so we felt safe with a good and friendly driver. The owner and property manager addressed any concerns we had quickly. I'm very happy that you did have a wonderful time ! I would be very pleased, I you should return again, to be there to meet you and your friend. Thank you very much again and all the best also for you friend. We spent the month of Feb in Bruno's beautiful condo in the Dominicus Marina. His place is right on the water so each morning we'd watch the boats go out from the patio, spent the day walking about the beautiful area, sunning by the numerous pools, taking excursions, or enjoying the spa at the club. Each evening we'd see the most breathtaking sunsets, and after a peaceful night's sleep, do it all over again! The condo is fully furnished for cooking and beds are comfortable. We will definitely be back! Thank you very much for your beautiful revue. If ever only in summertime you should travel to Switzerland, let me know. Wonderful beachfront House, direct in front of the Caribbean Ocean. The 2 apartment’s to rent, (3 Room’s each, accommodates max. 4 person per unit). They are located on the ground floor, facing a magnificent view to the ocean and the garden. Peaceful and relaxing!! The house is built into a magnificent superior holiday resort. Private seawater pool build upon the riffs, direct access to the ocean, you can swim anytime of the year. There is a First Class Restaurant with international cuisine in the club. Near the House, is another restaurant with very nice food that just opened recently? The apartment will provide you with air conditioning & free internet access Wi-Fi. Safety Safe. 1 Flat TV Screen, to connect to your own Computer devices for download streaming. Outside the veranda, you step into the private garden. You are sitting directly front Side Ocean. The guest room / dining area can occupy max. 4 guest. Also children are welcomed. The kitchen is full furnished with an electric plats oven (no gas!) a refrigerator toaster, coffee maker. All the Kitchenware are completely included! The 2 bedroom interior are made of massive wood (Queen-size bed). Every room has its own shower & toilet and a hairdryer. All Towels/Sheets/Linen are included! Suitable for children starting from 3 years.